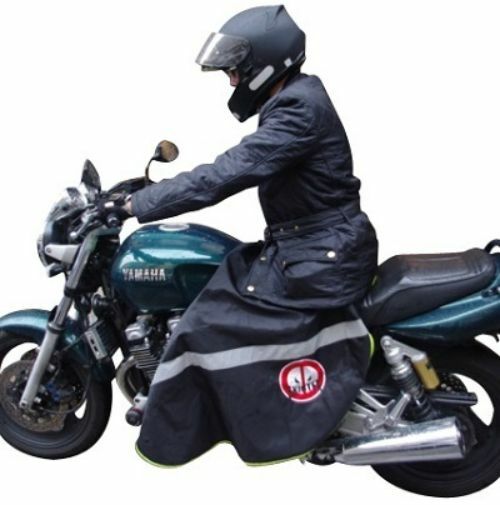 For you, scooter riders do not have you dreamed of having an ultimate lap apron against rain and cold, without having to "rivet" an apron in front of your two wheels. And for us bikers, what about non-existent protections for our motorcycle models or those that "disfigure" our beautiful "bikes". SKIRTEX did >>> One solution against rain and cold without attachment of any kind. No rivets, no strap ... absolute freedom. That's SKIRTEX. Thanks to its ingenious tongue, on which you sit, your weight keeps the lap apron in place. And once the trip is completed, you fold it easily with its revolutionary material in your top case or under your seat storage.. Thanks to SKIRTEX you use your lap apron when you need it. Imagine hot summers with your leg cover riveted to the front frame of the scooter. Now your coverage follows you anywhere, without requiring you. And then, on an aesthetic level, not dangling apron, and also no risk of robbery! Skirtex is THE solution, easy and cheap.